For more than 100,000 people around the world, November 17–23, 2013, was more than an ordinary work or school week. It was a time to celebrate GIS and geography at more than 1,000 GIS Day and Geography Awareness Week celebrations. The following are a handful of GIS Day festivities that in several magical hours educated, entertained, and inspired those who attended this year. The Regional Municipality of York—situated in Newmarket, about 47 kilometers from Toronto—celebrated GIS Day on November 15 at the York Regional Administrative Centre, says event coordinator and master of ceremonies Debra Kelloway, manager of GIS Partnerships and Special Projects for the Geographic Information Services branch of the Regional Municipality of York. York has celebrated GIS Day nearly continuously since 2003. The goal has been to put GIS in the hands of all regional employees as tools they use in their daily activities. Nadika Senadheera (see the GIS Hero article in the Fall 2013 ArcNews) helped orchestrate a GIS Day 2013 celebration at Mayo Primary School in Juba, South Sudan. 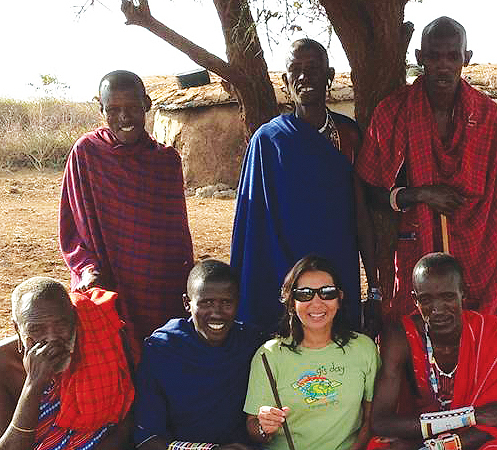 She also visited Amboseli National Park in Kenya, where she provided a teaching session for the Maasai community. GIS Day is part of a wider event called Get Informed, focused on the importance and power of information, technology, and analytics, as well as centralizing access to regional information. The celebration had 14 booths. Location analytics was one of the most popular, along with booths on privacy, interactive web mapping, and story maps—described by Kelloway as a "huge hit." "This whole area of mapping and analytics is something we spend a lot of time on," according to John Houweling, director of the Geographic Information Services Branch. "We want to get story maps into the hands of users so they can start doing that." Centro de Engenharias Doctum, Minas Gerais, Brazil, held its second annual GIS Day November 18–21. Following the same plan as last year, the engineering college had lectures by GIS professionals from three campuses. About 700 students between the ages of 18 and 30, as well as some high school students, participated, says Jordan Henrique de Souza, the center's director. Engineering course coordinators and instructors planned the event, which took months of preparation. Twelve thematic lecture rooms on campus offered students a variety of fascinating topics related to civil engineering, as well as electrical, environmental, and production themes. These ranged from remote sensing for unmanned aerial vehicles and analysis of wildfires by geoprocessing to selection of areas for hydropower by geoprocesssing. The Memphis Area Geographic Information Council (MAGIC) held its 13th annual GIS Day Conference November 14–15. GIS professionals, students, and end users came together to learn and share their expertise and experiences. Along with a keynote luncheon and multiple paper sessions, the MAGIC GIS Day included a $2,000 scholarship competition for undergraduate students, a map gallery competition, and social events. This year the event was held at the Bridges Center in downtown Memphis, which is operated by BRIDGES USA, a nonprofit dedicated to inspiring young people to become leaders in the mid-south region. The 2013 theme was "Decision Making Using GIS," says Andrew McColgan, a computer software specialist with Memphis Light, Gas & Water Information Services, the event sponsor. "This broad topic enabled us to invite and engage members of not only the technical GIS community but also the local government, utility, nonprofit, and private sectors," McColgan says. "In addition, of the over 150 attendees, almost one-third were students from local colleges and universities." A new, very popular session this year, called "The Doctor Is In," allowed attendees with a particular GIS" problem or question to sign up for small-group or one-on-one counseling and how-tos by local experts. The City of Palm Bay, Florida, hosted its 7th Annual GIS Day event inside city hall on November 20. The celebration, scheduled after working hours, was a "great success," says event coordinator DeAnna Krishak, GIS technician III with host Palm Bay Utilities. Palm Bay's local high school outreach throughout National Geographic Geography Awareness Week and GIS Day enabled the agency to interact and speak with about 800 local citizens and professionals—"the crowd we aimed for," Krishak says. For more information on GIS Day, visit gisday.com.